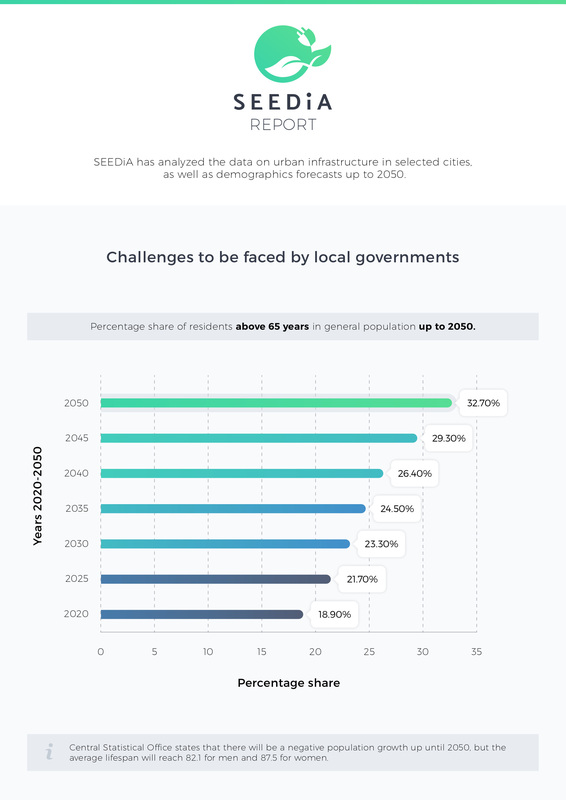 SEEDiA has analyzed the data on urban infrastructure in selected cities between 50,000 and 100,000 residents. This analysis shows great disproportions in the amounts of benches per 1,000 residents, with differences reaching more than 1,000%! 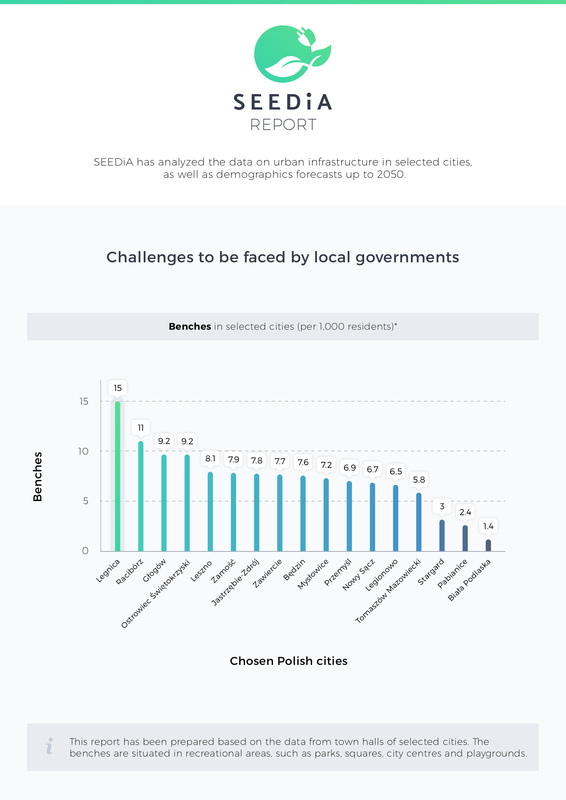 This is the second edition of the SEEDiA report – the first one focused on big cities such as Wrocław, Poznań, Cracow or Warsaw. An unsettling picture of urban infrastructure has emerged. It turned out that 1,000 residents of the capital of Poland have to fit on 2 and a half benches! Although a new low has been reached in the latest report – 1.4 benches per 1,000 residents in Biała Podlaska – some parts instil optimism. Among the cities we have analyzed, plenty of them have more than 7 benches per 1,000 residents, reaching the European standard. The best scores were reached by Legnica (15 benches / 1,000 residents), Raciborz (11 benches), Głogów and Ostrowiec Świętokrzyski (9.2). Leszno, with its 8.1 benches per 1,000 residents, takes the 5th place. Yet it does not change the fact that there are thousand of cities in Poland that are lacking places to sit down. Considering the latest changes in Polish demographics, it poses a serious problem for the citizens (with the society getting older) and a challenge to be faced by presidents and mayors. – It’s high time for cities to start actively participating in improving policies regarding small urban infrastructure. There has been much talk about smart cities, but the definition is still fleeting and the needs of the inhabitants are not being met. One of the issues is that there is not enough urban furniture – particularly in the light of the population getting older. Another important part is proper communication, real-time data analysis and free access to outdoor power within the city. – explains Piotr Hołubowicz, CEO SEEDiA. Experts state that the amount of benches should be closely correlated with the demographic structure. Polish population has been getting older for years now. The structure shifts towards people older than 65 years. What is more, the average lifespan keeps on growing for both men and women alike. In accordance with the forecasts by the Central Statistical Office for years 2014 – 2050, Polish population will be steadily decreasing, with 36.5 million in 2035 and less than 34 million in 2050. Central Statistical Office states that there will be a negative population growth up until 2050, but the average lifespan will reach 82.1 for men and 87.5 for women. It means that more and more senile citizens will be living in the city, increasing the need for places to sit down. Especially considering that 55% over 65 years old state that their favorite activities consist of taking walks and outdoor resting. All available suveys and interviews prove that city residents eagerly spend time outdoor – in parks, plazas and city gardens. It applies to families and retirees, as well as to youth. Benches are for socializing, after all – places to hang out, feed birds, romance. Benches are traditional pieces of urban infrastructure that keep on having a wide appeal. They are indicated by the residents more and more often as a requirement within the participatory budgets, since nowadays, they tend to provide far more than just a place to sit. Many urban areas are developing towards the smart city vision. One of the key elements is smart, ecological urban furniture. SEEDiA benches are a great example, equipped with solar panels, mobile chargers, free WiFi and a set of additional features. What are those? Well, it depends on the goals you need to accomplish and is only limited by the imagination. This report has been prepared based on the data from town halls. The benches are situated in recreational areas, such as parks, squares, city centres and playgrounds.